Ballebaazi is a fantasy sports platform which lets you play fantasy cricket. Currently, they have support fantasy cricket, but they are working to add Football soon. To play fantasy cricket you select 11 players from both the teams. Then you join a contest/league and compete against other users. Every time a player picks a wicket, scores, takes a catch, etc they accumulate points. And if at the end of the match your team’s rank is high enough you’ll win cash prizes. So as you know the basics. Ballebaazi works as any fantasy sports app work. You create a team, join a league(s), wait for the results. Ballebaazi has a decent interface. No problems there. The issue I have is, with their referral program and leagues. 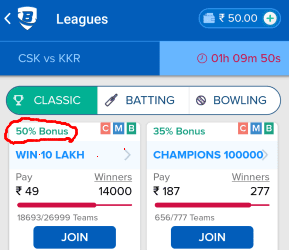 As you can see it's also given how much of the bonus you can use. BalleeBaazi also doesn't offer a great variety of leagues. BalleBaazi mostly has 1-2 Grand leagues. But the entry fee is also high. You’ll mostly find leagues with less competition. So if you like to take on fewer competitors, you'll find the league you want. These aren't big enough issues to rule out BalleBaazi app. It is still a good platform for fantasy players. Surely, not the best or second best. But if you want to try something new, go for it. You can earn Rs. 100 for every user you refer. You will get the referral bonus when your referred user deposits Rs. 30 or more. This is the classic fantasy where you can create a team of 11 players within the credit limit of 100 credits. You can select a maximum of 7 players from one team. Select a total of 11 players from the two teams within the credit limit of 100. Captain – Gets 2x points scored by the Individual. Vice-Captain – Gets 1.5x points scored by the individual. You can select a maximum of 5 players(batsmen) from 2 teams and maximum 3 players from 1 team. You can create a team of 5 bowlers that you think will take the most wickets. You can select up to 3 players from one team. C: Confirmed Leagues. The leagues are not canceled even if they are not filled. M: Multi-team entry. You can join these contests with multiple teams. B: You can pay a part of the entry fee using the referral and other cash bonus. Once your account has been verified you can withdraw your winning balance in you BalleBaazi account. You can withdraw your winnings to your bank account. The minimum amount that can be withdrawn is Rs. 200(at a time). BalleBaazi is an okayish fantasy sports platform. I wasn’t blown away by it. But wasn’t disappointed either. It takes a huge investment to let users use 100% of their cash bonus to join leagues. I don’t like taking risks so I just didn’t like that 😅. But they do offer something new- Batting and Bowling fantasy. I’m not bored with the “Classic” fantasy cricket yet. But if you are you can give BalleBaazi a shot. Register with this referral code: UKIFZY1 and get Rs. 50 referral bonus. Follow Infosmush and stay updated: Twitter and Facebook.